The design tutors I have had the pleasure of having throughout the years have been incredible. “I enjoy the freedom that we are given as designers to explore the briefs we are dealt. Our innovative thinking is embraced by the tutors and we are actively encouraged to explore material, methods, and processes. Particularly in final year when we have the freedom to create our own brief and follow our own unique design process which we have had the freedom to develop over previous years. “The design tutors I have had the pleasure of having throughout the years have been incredible. I would say that we are self-motivated as designers and generate work for ourselves, however the tutors are always there for support and guidance rather than being authoritarians. You can get a lot out of them if you when you involve them in your process. “We travelled to Valencia as part of our design theory module. The trip to enable us to gain insights into a different culture. Again, nothing was planned other than the flights and hostel so we had the freedom to explore and wander the sights of Valencia ourselves. “I did a 12-month placement as a design applications engineer at Solid Solutions UK. They specialise in Solidworks CAD and Solidworks training. I took the placement with the intention of learning Solidworks to further myself as a designer. The company encouraged and rewarded my learning and I was able to achieve ‘Expert’ status with over 12 certifications in Solidworks. These are recognised by both the design and engineering industry. My day-to-day job would be either the teaching of Solidworks to experienced engineers and designers or providing Solidworks consultancy and support. They even threw in a paid for ski trip to Austria. How will the skills you learnt on placement enhance your graduate employability? “The certifications I achieved are recognised by industry and are vert sought after. However, I feel my professional and interpersonal skills have become more valuable. My work ethic has changed and I am far more motivated to succeed as a designer. I feel those skills will enhance my employability more than my CAD skills. Tell us about your final year projects, what you’re designing, and your thinking behind them? 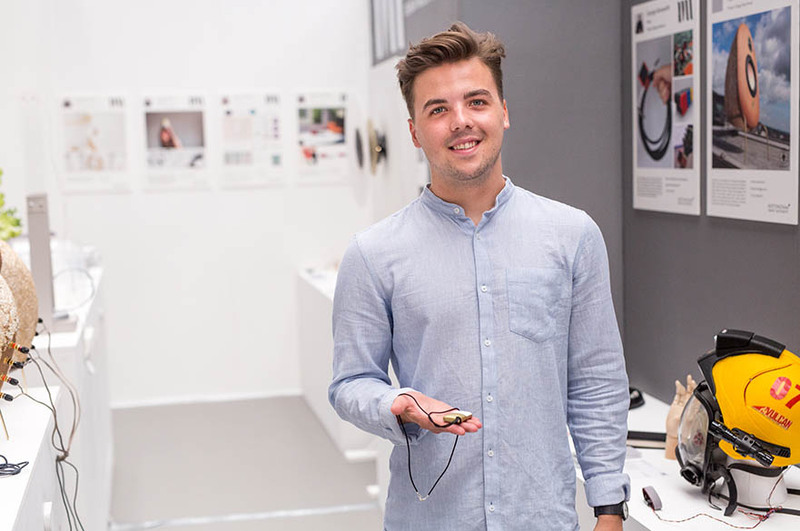 “For my minor project, I have designed a voice recorder for the elderly to help them share the ‘unheard voices’ of a forgotten generation. The device enables them to leave behind messages, geo-tagged in locations. Friends and families can re-live these forgotten moments by visiting those locations, unlocking voices, and listening to memories.